From its simple beginnings in 1865 in the poverty-stricken East End of London, England, The Salvation Army grew rapidly during the 1860s and 1870s. By the end of 1878, The Salvation Army in England had more than 75 corps (worship and service centers) with 120 officers (clergy). In October of that year Salvationists (Salvation Army members) Amos and Annie Shirley immigrated to the United States and began holding evangelistic meetings in Philadelphia. Their daughter Lieutenant Eliza Shirley soon followed them. Repeatedly throughout 1879 the Shirleys asked General William Booth, The Salvation Army's Founder, to send officers to establish The Salvation Army in America. In February 1880 George Scott Railton, the first officer to hold the rank of commissioner, led a group of seven women to expand The Salvation Army in Philadelphia and extend it to New York City and beyond. Soon corps were opened throughout New York, New Jersey and Pennsylvania. In November 1880 Railton moved westward and began Salvation Army work in St. Louis, Missouri, probably seeking a more centralized location. In 1881, Booth called Railton to return to England and sent Major Thomas E. Moore to lead The Salvation Army in America. Much of Railton's work was reorganized including withdrawing from the Midwest until 1885. In 1885 Commissioner Frank Smith, commander for the U.S. at the time, gave Captain and Mrs. William Evans $25 to start Salvation Army operations in Chicago. The couple worked diligently to create a highly successful Salvation Army ministry in the Midwest. By 1899 more than five dozen corps had been opened in Michigan, Indiana, Illinois, Iowa, Wisconsin, Minnesota, North and South Dakota, Nebraska, Kansas and Missouri--the states which now comprise the Central Territory. One early Midwestern convert was 16-year-old Edward Parker from Elgin, Illinois, who became an officer and opened a corps in Janesville, Wisconsin. Parker later served as a photographer during World War I, was instrumental in initiating the USO (United Service Organizations) during World War II and served as The Salvation Army's national leader from 1934 to 1943. The Salvation Army underwent many changes during its first 40 years as states were added to the union and as the population shifted westward and southward. Initially, all states west of Michigan, Indiana and the Mississippi River were designated the Department of the West. The creation of this department in 1905, with headquarters in Chicago, was a forecast of growth and expansion for the Army. Continuing to grow, The Salvation Army subdivided the country into the Eastern, Central and Western territories by 1920. Six years later, the Central and Eastern territories were so large they divided once again, creating the fourth U.S. territory, the Southern Territory. With a more concentrated geographical area The Salvation Army's work in the Midwest flourished. From its early years The Salvation Army began many social service programs which have shaped its ministry and identity up to the present. In 1888 the first Midwestern rescue home for unwed mothers was opened in Grand Rapids, Michigan. Later The Salvation Army operated hospitals for unwed mothers throughout the country. These hospitals were phased out in the 1980s due to changing mores and increasingly costly demands for hospital administration. Also in the 1880s, The Salvation Army established hotels for homeless men, allowing them to pay a few cents per night for warm, safe lodging. These hotels developed into a comprehensive alcoholic recovery programs by 1897 and now are known as harbor light centers and adult rehabilitation centers. During the Great Depression, The Salvation Army opened large feeding centers in major metropolitan areas, feeding thousands of people per day despite a decline in donations. Today, food pantries and feeding programs continue to operate throughout the Central Territory. Music has been an integral part of The Salvation Army from its very beginning. When Commissioner George Scott Railton and the seven women officers stepped off the ship in New York Harbor they sang hymns to attract a crowd and announce The Salvation Army's arrival in the United States. 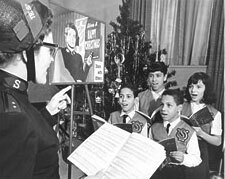 Music frequently has been used in The Salvation Army to attract attention, communicate the message of the gospel and bring an air of enthusiasm to Salvation Army meetings. Singing and/or performing instrumental music on street corners has become a hallmark of The Salvation Army. The first officially recognized Salvation Army brass band in the United States was in Grand Rapids, Michigan. This band also holds the distinction of having the first U.S. bandmaster (conductor), drummer and drum major. Although The Salvation Army continues its tradition of brass bands, many Salvation Army corps also have developed contemporary bands, choral groups, interpretive dance troupes and other modern musical expressions to keep pace with the country's changing culture and musical tastes. One of the best known Salvation Army bands in the world is the Chicago Staff Band, comprised of Salvationists from the Chicagoland area who perform professional-quality brass music under the direction of Bandmaster William Himes. The Salvation Army is well known for providing summer camps for children, especially in urban areas. 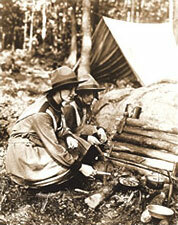 It is believed that the first Salvation Army camp was held in Kansas City, Missouri, when 20 tents were pitched in Fairmont Park in the summer of 1897. In 1904 The Salvation Army in the Chicago area purchased land for a permanent camp in the suburb of Glen Ellyn, Illinois. As suburban population increased, The Salvation Army sold that property in the 1920s and bought lakeside property in Camp Lake, Wisconsin. Opened on July 4, 1924, the Wonderland Camp and Conference Center is the oldest continuing Salvation Army camp in the United States. The Chicago area camps also resulted in another Salvation Army innovation: the establishment of advisory boards consisting of prominent business and community leaders who voluntarily give advice and guidance, increase public awareness of The Salvation Army's purpose and programs, raise funds, recruit other volunteers and give hands-on assistance. Beginning with a seven-member board in Chicago in 1904, The Salvation Army has developed advisory boards and other advisory organizations devoted to specific purposes and programs around the world. Today there are more than 71,000 advisory organization members in the United States. Publishing also has been important to The Salvation Army from its inception in England. 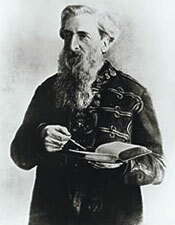 William Booth and his wife Catherine both wrote prolifically to proclaim the gospel message, to instruct and to encourage new converts and to communicate The Salvation Army's purpose and mission. From the adoption of the name The Salvation Army, the movement's official publication has been known as The War Cry. The name The War Cry also was adopted for the magazine in the United States. In 1880 the pioneer of The Salvation Army in the United States, Commissioner George Scott Railton, published a small newsletter titled Salvation News. After moving to St. Louis, Railton published the first American issue of The War Cry in January 1881. Publication of The War Cry continued under Major Thomas E. Moore and his successors. From 1920 to 1970, each U.S. territory published its own individual version of The War Cry, reporting regional, national and international Salvation Army news and providing inspirational and evangelistic articles. In 1970 The Salvation Army's National Headquarters began publishing one nationwide edition of The War Cry, and each territory developed a distinctive territorial newsletter to report on events in their geographical areas. Doris Lowcock took the reigns in the Central Territory and created the country's first territorial newsletter. It was named Central NewsCentral Connection in July 2003. Numerous Central Territory Salvationists also have made significant literary contributions. Throughout The Salvation Army's more than 100 years in the Midwest, countless Salvationists have made exceptional contributions to humanity, the organization's development and the growth and strength of the Christian Church. Seven men and two women from the Central Territory have received the Order of the Founder, The Salvation Army's highest award. This award is given to those that follow in the Founder's footsteps to change the world. The Salvation Army has a rich, exciting heritage in the Central Territory. Feel free to explore further by clicking on the links to The Salvation Army's international and national home pages. Also examine the varied services provided by The Salvation Army by clicking on the links for disaster services and for programs and services. Just as important as what The Salvation Army has accomplished in the past or is doing in the present is its strong vision for the future. This is The Salvation Army of the new millennium! The Salvation Army comes to Detroit The Salvation Army landed in the United States in 1880 and began serving Detroit in 1887. But just as the earliest soldiers of the Army had faced opposition in England, so too did the officers who established the work in Detroit. Their concern for the poor challenged the norm and shed light on social ills that others preferred to pretend did not exist. Not long after the first Salvationists assembled in the city, local government passed the Campus Ordinance, proclaiming, "No man may make a speech or blow a horn or beat a drum within one half-mile of city hall. As much of the Army's early work depended on street meetings designed to attract people in need of aid, the ruling was a major setback. But, Colonel Blanche Cox, who commanded The Salvation Army in Detroit, challenged the ordinance. Over a period of months she was arrested and brought before the court 12 times. Her sentence was suspended only once. She spent months in jail for disturbing the peace, but even as she did, a public outcry grew in her defense. Soon, The Detroit News, led by its founder, James H. Scripps, made The Salvation Army a front page issue. With support from community leaders, the law was repealed and The Salvation Army earned its right to serve those in need. The Salvation Army is now at work in 127 countries and benefits more than 20 million people each year in the United States alone.